When a person decides to make a home complete, they will do all that’s necessary to buy furniture, create a nice garden and even go to extent of placing other items that make the place more presentable. This is all for one ultimate goal, to make a living place a comfy and tranquil home. These are items that are used to add aesthetic value to a room, in regards to a person’s taste and preference. 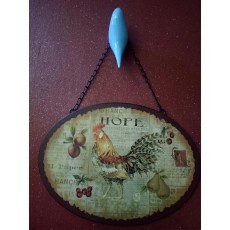 Among the decorative items that you can place in you house is hope plaque. You can place this encouraging plaque in your living room or bedroom a place where you can always see it. It is made of iron material which is very unique and durable. You can also gift this inspirational plaque to those who are embarking on a new adventure as a reminder, with God, their future is bright and their hope is great!